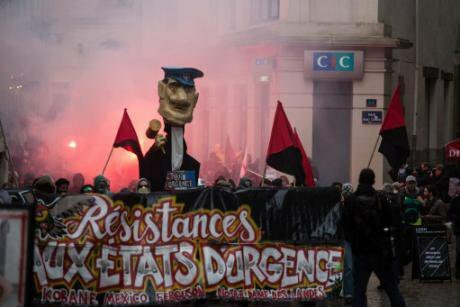 Protesters march through Nantes with a puppet dressed as a judge wearing a police officer's cap, during a demonstration against the state of emergency on February 20, 2016. Niglaut Kevin/Press Association. All rights reserved.Like an addict, France does not know how to quit its state of emergency even though it has become clear that maintaining it erodes the rule of law and fosters human rights abuses while not keeping the country safer. The February 22 report by the parliamentary commission tasked with monitoring the state of emergency provided yet another reminder that it no longer serves any meaningful purpose. 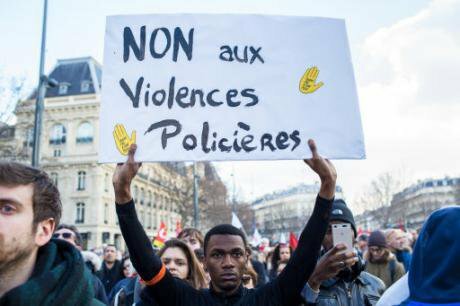 Student protest against police violence in Paris,February, 2017. NurPhoto/Press Association. All rights reserved.